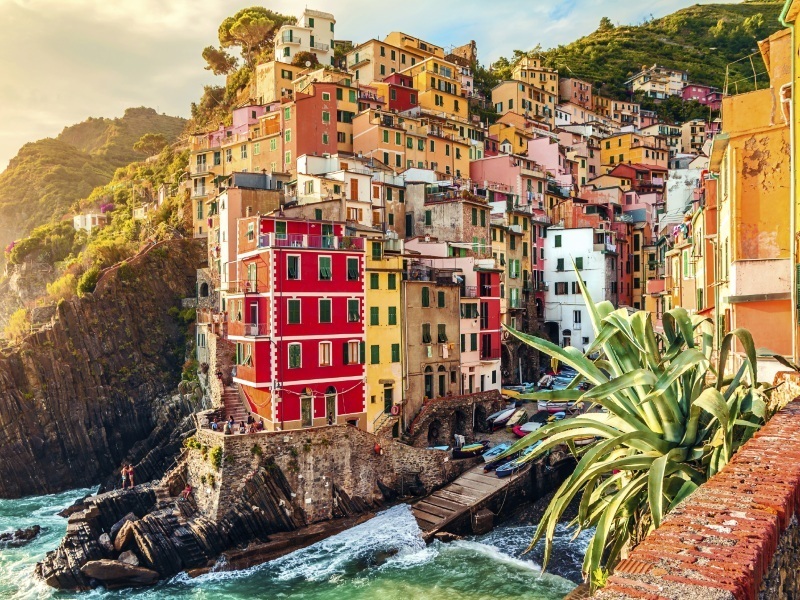 This Italian holiday takes you to the millionaires’ haunts of Portofino and Santa Margherita Ligure and the spectacular landscapes of the Cinque Terre and Lake Maggiore, perhaps the most impressive of Italy’s sparkling lakes. Along the way you will travel on the picturesque ‘Three Valleys Railway’ into the heart of Columbus’ maritime city of Genoa, and visit Pavia, a medieval city with a Visconti castle, and whose cathedral boasts one of Italy’s largest domes. While in Santa Margherita, you will enjoy a boat trip to Portofino and a train journey through the Cinque Terre. Day One: Flight to Milan, transfer to your hotel on Lake Maggiore for two nights half board accommodation. Transfer times from Malpensa, Linate and Bergamo are 30 minutes, 1 hour and 1 hour 30 minutes respectively. Day Two: Free day to explore Lake Maggiore. Why not take a boat trip on the lake? Day Three: Today you travel south to the Riviera di Levante. Your first stop is Vercelli, an historic town surrounded by paddy-fields (its rice is exported worldwide). You then continue south to Casella, north of Genoa, arriving after lunch to board the ‘Three Valleys Train’. Since 1929 the red and white carriages of this narrow gauge service has linked Columbus’ home city with the villages and valleys of its hinterland. The trip down to the city takes about an hour, and there are excellent views of the coastline. In Genoa you will see something of the restored port and old city centre before you complete your journey by coach to the chic resort of Santa Margherita Ligure, where you spend four nights on a half board basis. Santa Margherita lies in a sheltered bay, close to Portofino. Its harbour is home to many luxury yachts. The journey today is 135 miles. Days Four to Six: In Santa Margherita with included excursions by boat to Portofino (half day) and by train to the Spectacular Cinque Terre (full day). Portofino: like the millionaires, you travel to the world’s most beautiful harbour by boat (15 minute trip) from the landing stage just 500m from your hotel. Portofino’s colourful hotchpotch of fishermen’s houses embraces its harbour and the luxury craft of the nearby villa-owners – Portofino is the select retreat of Italy’s powerful! Above the harbour is Brown’s Castle, and there are good views from the church. You can see why Disney copied it – the original is stunning! Cinque Terre: the spectacular coastline, hills and villages landscapes of the Cinque Terre are UNESCO listed and within the National Park, where the mountains drop almost vertically into the sea. You will travel by the train from Santa Margherita (the station is 600m from the hotel). The ‘Five Lands’ are about an hour away, and comprise the unspoilt traffic-free villages of Monterosso, Vernazza, Corniglia, Manarola, and Riomaggiore, which nestle in tiny coves, set below the ingeniously terraced vineyards that, together with the fishing, gave the area its livelihood. Day Seven: You leave Santa Margherita and travel north, following a slightly different route to take in the cathedral city of Pavia. Pavia rivalled Milan as the capital of the Lombard kings until the 11th century, but was then ruled variously by Austrians, Spanish and French. There were 100 medieval towers, just two remain – but there is still plenty to see! La Certosa, a notable Renaissance monastery, lies just to the North of the city. You arrive at Lake Maggiore in the afternoon, for one night, again on a half board basis. Total today 152 miles, mainly motorway. This four-star hotel is in two adjacent buildings in the centre of Stresa, overlooking the lake and opposite the boat station. The Speranza has a pleasant street-front café while the Milan houses the hotel restaurant. All rooms have bath or shower, wc, hairdryer and satellite tv. Lake view rooms are available at a supplement. Milan Speranza guests have use of the swimming pool at the nearby Hotel Regina Palace.